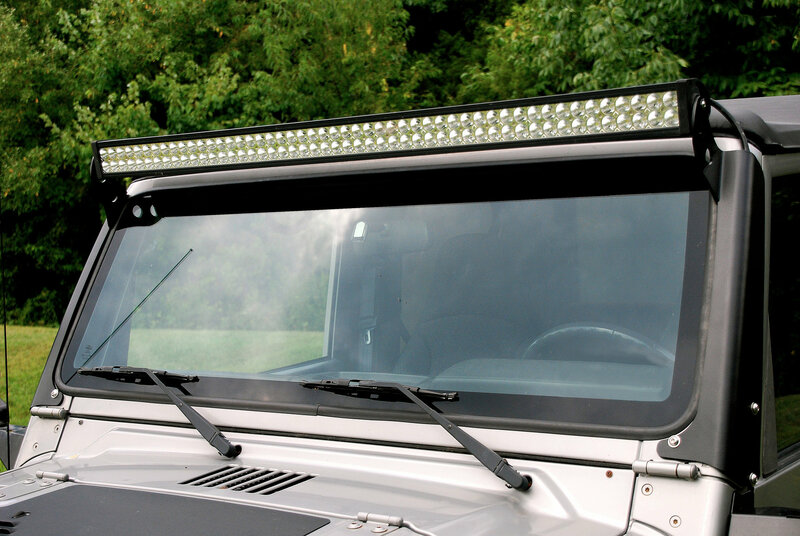 Hyline Offroad TJ Light Bar Mounts allow you to easily install a 50" LED Light Bar above your windshield. The Light Bar Mounts are manufactured using 3/16" thick steel, laser cut and formed using a CNC precision press brake. They are designed as one piece construction with no weld seams for a smooth finished cosmetic look. No drilling or other modification is necessary for installation, they simply bolt to the windshield mounts using provided stainless steel fasteners. Precision cut Rubber Gasket liners are included with the light bar mounts to protect your vehicles paint from scuffing. All brackets are finished complete with E-Coating & Black Fine Texture Powder Coating for superb corrosion resistance. Fits All TJ Model Years 1997-2006. Actual dimension between mounting brackets is 52. Make sure the light you order measures 52 overall, from end housing to end housing.